Craig Dowse and Dave Beever. Two members of the Boston Buccaneers Rugby League squad have been selected to represent the Midlands Lionhearts on tour. 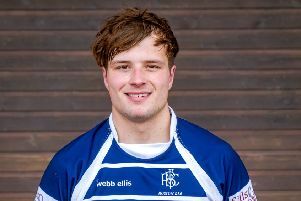 Craig Dowse and Dave Beever (pictured) will compete in an upcoming tour of Greece, organised to allow players from the Midlands - who funded the tour themselves - to have the opportunity to play on the international stage whilst at the same time giving Greece Rugby League the opportunity to give its representative sides additional game time. Head coach Patrick Wilson has named a 22-man squad for the trip this summer where his side will face AEK Kokkinias on June 4 and Neapoli Lakonia on June 6. The squad features players from 11 different teams. The Buccs will will face Bedford Tigers in a pre-season fixture at the Boardsides on Saturday.